These page protectors won?t transfer toner from your pages. Perfect for enhancing and protecting any and all of your documents. Pick up a pack today and ensure the visual quality and safety of your documents. I'm so thankful that this company still sells this supply. This is the only place I would buy them. These sheet protectors are very versatile. They're able to fit in both my presentation binder as well as a three-ring. This makes things a lot more convenient. GBC swingline sheet protectors-the best Review by Bernice N.
GBC swingline sheet protectors-the best for putting my choir scores in. Is the swing ring sheet protectors top loading or side loading? Thank you for your question. 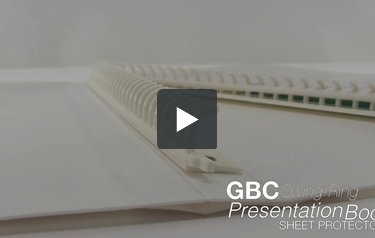 We verified with the manufacturers that the GBC Swing-Ring Sheet Protectors are top loading. Which of your binders work with this refill? These sheet protectors are designed for use with the GBC/Wilson Jones Swing presentation easels. Unfortunately the swing ring easels have been discontinued. However the refills are still available if you have these binders and are using them in your organization. Can you tell me what punch pattern this is? These swing ring sheet protectors use their own punch pattern that is designed specifically for GBC Swing Ring presentation Easels. Unfortunately the easels are no longer available but the refills are.